The joy of living in a small town is that you can bike everywhere. Any restaurant, store, or market, I can easily get there in 5-10 minutes by bike. I wake up every morning with a nice little bike ride to school. But when that is your only mode of transportation, in a place where it RAINS all the time. It can prove to be a problem. Today, after a long day of 6 hours of class, all I wanted was to come home and relax. But as I locked up my classroom and looked outwards, I noticed a little something: it was POURING rain! Oh yes, the standards of “pouring” are a little different in Thailand. I have seen nothing like it. I have heard nothing like it. It is absolutely ridiculously insane. But its normal here. And as I waited to see if it would subside, a thunderous boom was heard behind me and I figured this can only get worse. Its always nice to enjoy a nice bike ride in the rain when you’re wearing a white skirt! I wish I had a picture of it. You can use your imagination though. Trying to man the potholey streets of Lang Suan, one hand on the rikety old bike, and the other holding a broken umbrella is my first choice for a good time. 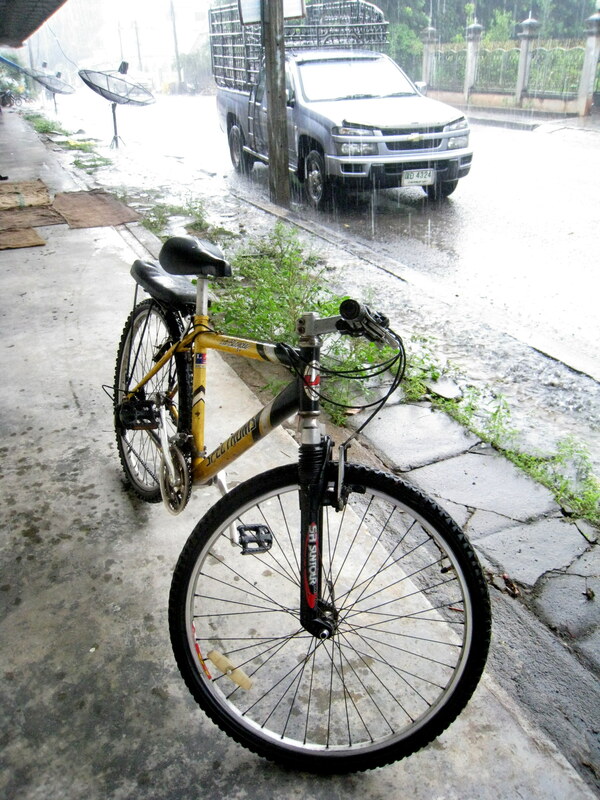 I have attached a picture of the beast I like to call a bike in the rain that I had to ride through. Not sure if the picture can really catch the essence of the downpour but I tried….